Whisk yogurt, cream cheese, powdered sugar, and vanilla in small bowl until smooth and well blended. Combine strawberries and granulated sugar in small bowl; gently toss. 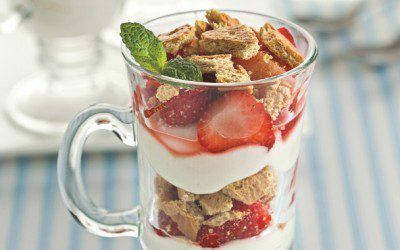 Layer 1/4 cup yogurt mixture, 1/4 cup strawberries, and 1/4 cup graham cracker crumbs in each of 4 dessert dishes. Repeat layers. Garnish with mint. Serve immediately. Exchanges per serving: 1 bread/starch, 1 fat, 1 fruit, 1 meat.